In the 1950s, this design might have been a prediction of future style. A half century later, it's future-retro and worth the wait. The taper of the shade and the angle of its cut deliver visual intrigue while perforations at the crown create an interesting play of light. 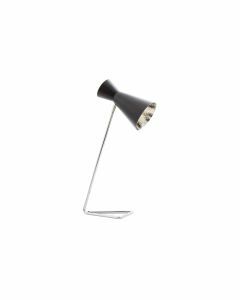 The item features polished nickel lamp on the granite base. The lamp comes with the clear cord and takes 25-Watt Max light bulb. The socket type is B-E12. This lamp measures 10’’W x 7.5’’Dia x 22’’H. Click images for greater details.